Multi-Month GSTR-2A download is an important task that GST registered businesses must do periodically for timely and up-to-date reconciliation of the Input tax credit (ITC) claimed. GSTR-2A of a taxpayer is a monthly auto-populated return that consolidates all purchase details made by him. It is available for every tax period with the ITC details extracted from the GSTR-1 filed by the corresponding suppliers. GSTR-2A is available to taxpayers on the GST portal for download, usually at the time after the filing of GSTR-1 for the month or quarter around 12th of every month or any day after the due date of quarterly GSTR-1. GSTR-3B is the summary return filed every month, where the ITC is being claimed on a provisional basis. The GST authorities at the time of examining the details mentioned in the GSTR-3B filed will adopt various means or tools to verify the authenticity of the ITC claimed. GSTR-2A is one such means to check accuracy. 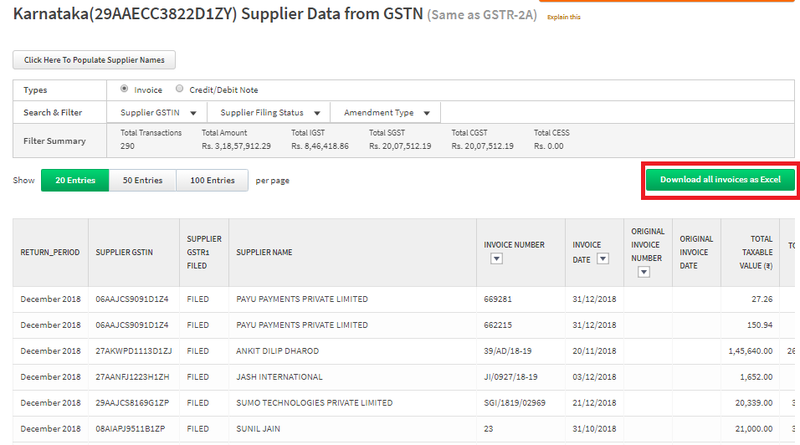 GSTR-2A return (Supplier Data) is currently available in an excel format on the GST portal after logging in. The return can be used by taxpayers before filing GSTR-3B for the relevant month; The purpose is to check whether the purchase invoices reported by corresponding suppliers are in line with the amount of ITC intended to be claimed in GSTR-3B. Help the taxpayers claim 100% ITC in GSTR-3B as being reflected in the GSTR-2A so that genuine ITC claims are not missed out. Multi-month GSTR-2A report assists businesses to reconcile the input tax credit claimed across the tax periods in a financial year. Some businesses file GST returns in GSTR-1 monthly whereas some file it quarterly. This leads to a delay in reconciliation exercise by a business especially, when the supplier is filing quarterly GSTR-1 as compared to business filing GSTR-3B regularly every month. Later on, when the updated GSTR-2A is available with such quarterly reported invoice details, the business must do a matching exercise with ITC claimed in GSTR-3B filed till date, to check for any lapses. 3. How can ClearTax GST help you? It provides various options for a user to ingest data to prepare the GSTR-1, GSTR-3B or GSTR-4 in under minutes. Options like excel ingestion or direct integration with ERP are available for importing sales or purchase data into ClearTax GST software. A user has to import the sales data for GSTR-1 just once. Based on this, the software auto-populates the details into GSTR-3B in a click of a button. Furthermore, the user can fetch GSTR-2A data easily from the GST portal, across months using the ‘Multi month GSTR-2A’ Report. The ‘Advanced Reconciliation Tool’ within the product will help reconcile GSTR-2A with purchase data. It shows differences precisely allowing users to make necessary adjustments in ITC values in GSTR-3B or take any necessary action. Thus, one can avoid errors and ensure 100% accuracy in reporting of data in GSTR-3B with minimal manual intervention. Download the GSTR-2A data in an excel format for further use. Step 3. 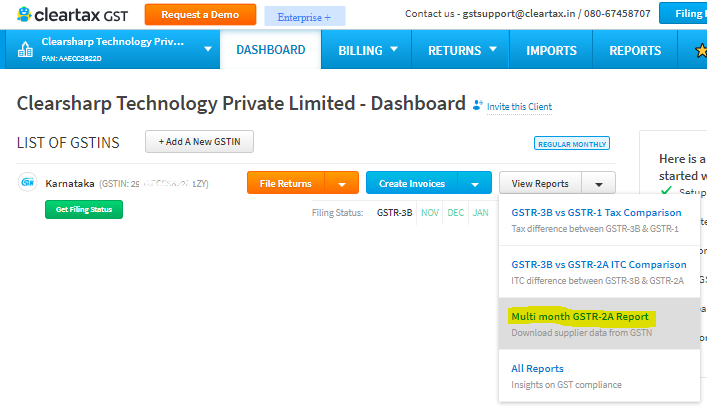 Click on ‘Download Multi month Supplier data from GSTN’ – perform a one-time verification with GSTN login credentials. Step 4. Report gets generated on the screen. Sort the data by applying filters. Click on ‘ Download all invoices as excel’ to get the report in excel format.